Last week, we brought the sad news that many of you who had ordered the Google Nexus 4 might have to wait up to three weeks for your handset to arrive. 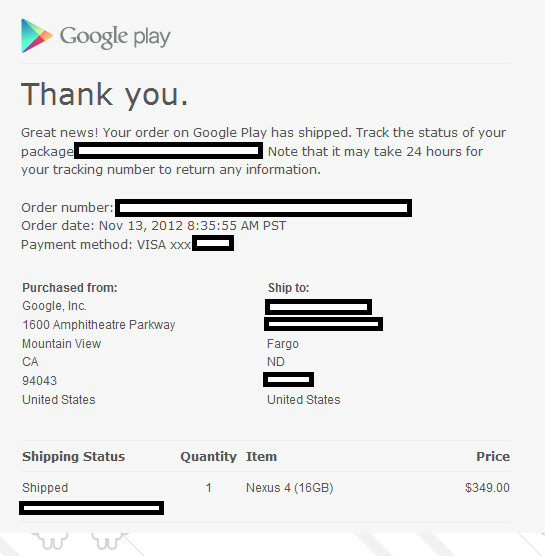 That news came at almost the exact time that some were receiving email confirmation that their Google Nexus 4 was on the way. Based on some new emailed shipping confirmations that have been received, it looks like many of you won't have to wait three weeks at all for your stock Android phone. We're not sure how many units are being shipped, and judging from the order date on the shipping confirmations, most of you who are waiting for the phone purchased it not too long after it first became available on the Google Play Store, where it sold out within a half hour of being cleared for sale. Speaking of the Google Play Store, the phone remains sold out, leaving T-Mobile as your only alternative to paying some multiple of the price on eBay. 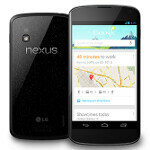 If you do find the Google Nexus 4 at your local T-Mobile branch, you will have three options. You can lock yourself up for two years and pay $199 for the 16GB HSPA+ model of the phone, getting $50 of that back with a mail-in-rebate, or pay $499 for the unlocked version. The problem with the former is that you might not want to wear 2-year handcuffs, and the problem with the latter is that the price is $150 above the $349 charged for the exact same phone at the Play Store. So that brings us to the third option, which is waiting for inventory of the phone to be replenished. Remember, these aren't Milano cookies being punched out by magical elves in a tree house and we would assume that it might take some time to build up a decent stockpile of the Google Nexus 4 in the wake of this heavy demand. The question is, would you rather pay $150 more and have the phone in your hand now (assuming that you can even find a T-Mobile with the unit in stock), or wait for the Google Play Store to resume sales? ummm yeah I have to say NO THANK-YOU to this underwhelming POS... wow nexus really CAN'T wow anymore can they??? You can always buy another phone. No one is making this the official phone for your country. Go buy a $700 unlocked Note II. Phone is amazing for the price you get. So is the Nexus 4. Will wait for play store to get it in stock.. Your right,time to wait and relax! If I would be in need of a new phone, I would just wait to be restock. No reason to pay the extra $150.00. Did it charge you recently or did it charge you that day?you received any confirmations or anything? Would have loved to get this but the 16gb limit is a deal breaker. Will aim for the HTC Deluxe but only so long as it has SD card slot for additional memory or better still 32gb or 64gb non expandable!